Should I get a long term, full medical policy or shorter term medical insurance? Cruisers tend to be frugal and they like to be self sufficient, they have to be when going into the harsh, often isolated environments they travel in. Many cruisers also like the idea of being independent of their ties and obligations in the U.S. so what I am about to explain may come as a bit of a surprise. You might not want to cancel your health policy yet just because you are going cruising for a year or two. You might want to keep it and get it raised to the maximum deductible until you return. Under power or sail to far away lands offers it’s own unique challenges. Thinking about how you will cover medical expenses shouldn’t be one of the things you have to worry about. It is important to carry a policy that will cover you and your crew wherever you go. The main difference between these policies and the standard international policies is that they can accommodate a changing captain or crew on a vessel that may take on crew to deal with long ocean passages. There are also group policies designed for larger crewed yachts, fishing vessels and cruise ships or the individual crew members who work on these ships. Why? Aren’t there policies that give me full medical coverage all over the globe? Yes there are, and one of those plans might be right for you, I will address that later. Those plans are a little more expensive and will meet every medical need you have all over the globe and are renewable for the rest of your life. If you drop your existing policy, even for a short time it may effect your ability to get coverage when you return to the U.S. Dropping one plan for another can influence what is called continuous coverage. Read more about short term and long term insurance plans in our article “what is travel insurance?” FAQ. What is continuous coverage?Continuous coverage means that you have had a health plan in-force for a period of time, say, your current job and regardless of what happens to your health, they have to keep covering you until you drop the plan. If you drop your plan for a new one, all your past medical history, as well as things that happen during the time you are cruising can be held against you. When you come back to the US you may not be able to get any insurance. If you or your spouse have a job with group health coverage where they are required to cover you regardless of your health, than you may be a better candidate to drop one plan for another. John (57) and Jane (52) go cruising for two years. They know they are going to do a caribbean circuit, spending most of their time in the Caribbean and the mainland of central and south america. After two years they know they will be coming back to their jobs or continuing with other aspects of their retirement. John and Jane drop their insurance A plan and get a comprehensive plan from insurance company B. A year and a half into the trip John develops a debilitating disease, they get treatment back in the states, the plan covered everything. John gets better and they decide to continue their cruise, actually cruising for an additional year. Now John and Jane return to the U.S. and decide to get some health insurance. They go back to insurance company A and John can’t get coverage because of his disease history. They won’t even give him a rider for his preexisting condition, he can’t get coverage from any carrier. If John had had the good fortune of being employed by an employer with a group plan, than most likely he would get the coverage he needed even with his disease, but an individual policy will be next to impossible to find. If John and Jane had kept their home policy in-force but raised it to a very high deductible it would have cost them more money. The insurance would have covered John’s disease the same, and any other emergency that they had, but when they got back to the States they could have lowered their deductible back down and continued with their insurance plan A, because they had continuous coverage. If they decided to spend another winter in the Caribbean they could have picked up another 6 months of temporary insurance and been covered for whatever emergency that came their way. What if I’m going cruising for a long time? If you are going to be gone on an open ended cruise, living as an expatriate on your vessel or going on a planned circumnavigation then you definitely want to weigh the benefits of getting one of the full medical plans that will provide you with coverage that will include routine doctor visits, pregnancies, health care visits for children and other non-emergency medical care. These plans are continuously renewable and anything that happens to your health during the time of your voyage will not count against you upon renewal. 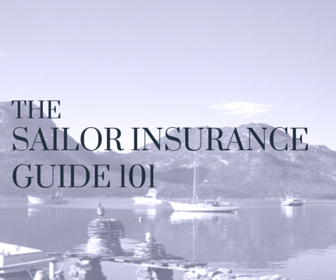 Visit our page on sailors and crew insurance to find out more about these plans.